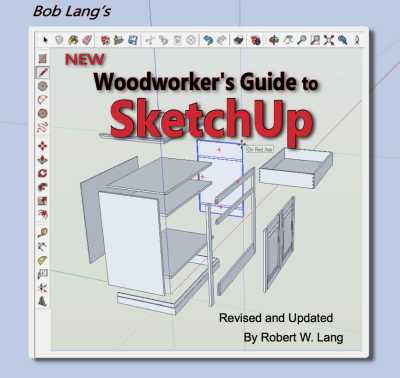 It’s hard to believe it was almost 5 years ago when I first reviewed “The Woodworker’s Guide to Sketchup” by Bob Lang, fast forward to today and I just recently received the latest updated and revised version which I can’t wait to dive into. When the original version came out in 2010 Bob had been successfully teaching woodworkers how to get the most from the 3D drawing system in classes at Woodworking in America and through DVDs and posts online. With the publication of this unique style of digital book Bob delivered a product that was both informational and interactive for the reader. How is it both? The Woodworker’s Guide to Sketchup is an enhanced PDF book with embedded videos that help to reinforce what the user just read. In this way Bob was able to take the technique or tool he was discussing in the chapter and then support the lesson with a quick demonstrational video where he brings it all together and shows just how easy it is to do. This is a great way for many of us to learn what might ordinarily be an intimidating drawing system. I can say with absolute certainty the original version of “The Woodworker’s Guide to Sketchup” is why I feel confident enough to use Sketchup for 99% of plans and drawings when working on a project. With it I can easily navigate my way around the system and make working drawings (with plenty of details) quickly and accurately time and time again. For more information, including sneak peeks inside the book, or to order your copy visit www.readwatchdo.com, Bob’s website where you’ll find tons of great information. To get your name entered in the giveaway leave a comment below telling us about either your favorite feature in Sketchup or your biggest frustration. The winner will be randomly drawn from the comments submitted on this post (one comment/per person, all comments must be posted by Midnight EDT June 5, 2015) and will be announced sometime on June 6, 2015. The winner will be emailed with all the information to receive their free copy of The “New” Woodworker’s Guide to Sketchup. since woodworking is a hobby, and I still have to work for a living, I don’t get much time on sketchup. I love the push-pull function. I’ve gone through videos and learning sessions but because it might be months before I get back on sketchup, I tend to forget most of what I learned. Maybe if I get to retire some day I’ll use it more often and really become familiar with all the great features/functions! It may be simple but my favorite feature is the copy function. Its a huge time saver. My only grip is that some of the functions are a bit hidden. Frequent users dont have a problem remembering the shortcuts but part timer’s like myself have to dig around which often takes more time than doing it the hard way. Matt – the thing I appreciate most about sketch up is the ability to show someone my idea without having to fumble around with bad pencil sketches and fumbled words. It has totally changed the way I can communicate with others about my projects. I have too intimidated to embrace the technology… this is something I need to learn. My favorite part of Sketch up is the 3D imaging and rotation. My biggest problem with it is my lack of knowledge and I know that means spending more time with it so that it becomes second nature. The best part of SU is how intuitive it is for 3D modeling (at least compared to other CAD software). I like it for initial design visualization, and showing different options to clients. I don’t really like it for final rendering (really dislike the materials). I haven’t really used it for documentation yet (printed plans or cutlists) – I guess I need more time on those aspects to see if they’d work for me. I struggled with Sketchup before I learned about layers. I was always trying to zoom in to see a feature, through another feature and would find myself inside of a table leg or whatever. Once I learned about assigning components to layers, I could clear the clutter and see only what I was working on. Great program. Better if you either watch all the tutorials, not just the first five. Most frustrating thing – not having enough time to devote to learning it, with 4 kids under age of 7, kind of hard to find time. I like the fact photos can be imported for conversion to a diagram. I like building the virtual room where the virtual furniture will go in. Gives a greater sense of proportion. Also being able to upload all sorts of models from others is a great reference tool. my biggest frustration with Sketchup is forgetting what I learned. I have the basic skills and just as I am getting the hang of it I don’t use it for a little while as I am spending what free time I have making sawdust. When I got back I seem to forget what I have learned and have to reference learning tools like Rob Lang’s book! Sketchup is great, it offers some of the great features found in productucts like Autodesk Autocad and Autodesk Inventor. The 3d modeling done with Sketchup allows me to provide a visual plan to the wife and makes it so i can get ideas out into the real world. I also like the ability to design joints into the model instead of having to mentally account for them. I bought the original directly from Bob. It was a great resource and helped as I was just starting to play with SketchUp. I would recommend any of Bob’s books, videos or articles for any woodworker as he is brilliant without talking way over everyone’s head or talking down to anyone. He is one of the best tutors I have ever come across. My main frustration is that I am slow with the program, and I don’t have enough time to devote to woodworking as I would like. So when I do carve out time it is usually not with the computer and in the shop instead. Having Bob” holding my hand” during the learning process would be terrific! Biggest problem I have is with the “follow me” technology. I’m trying to incorporate compound curves into my projects, and I end up with a massive explosion of hollow panels that have nothing to do with the plan I’m trying to create… So I end up doing a blocky approach. I create multiple square panels that approach the look I’m going for, (or resort to a basic square box) and say “pretend this is a smooth line” to those I show the plan to. My biggest frustration is using the orbit tool. Sometimes I simply can’t figure out how to get the perspective view that I want. It doesn’t seem to go where I want it to. My biggest frustration is forgetting the functions of each button. I need a cheat sheet for them. I still have trouble using the follow me tool. I know there must be some secret information to getting it to all come together, consistently, but I haven’t found it yet. Maybe this new guide will have the answer for me. Best feature is just that, all the features and options that are available. My biggest frustration with sketch up is trying to use the move tool to put components where they need to go. My biggest frustration is that I don’t know how to use the dang thing. I need an easy way to design project. Paper and pencil is just not cutting it. My biggest frustration is it takes to much time to learn and to much time to use. Simple orthographic mechanical drawing works fine. I played around with SketchUp years ago when it first came out and was extremely frustrated with the usability (moving things around, arranging objects etc), but I came back to it a couple years ago and was amazed at how much the usability had improved. Planning my projects in Sketchup has really helped me as a beginning woodworker, but one thing that would be nice is an exploded view feature – like a typical parts diagram. I was never able to hunt down a working plugin for recent versions. I’m computer stupid when it comes to anything other than the internets. Tried to learn sketch up, didn’t work out to well. Having learned both Autocad and Microstation I know that half the secret to becoming proficient is first understanding the basic concepts, then memorizing the unique series of steps to create a visualization of your design. Like other commenters I have a problem finding the time to learn this second step as it applies to Sketchup, but I love the program and its potential. I know I missed the deadline for the giveaway, but I’ll leave a comment anyway. My biggest frustration comes when trying to rename a component. The software often forces me to include parts of the old name in brackets along side the new one. I don’t understand why it won’t just let you rename something. Or if you have deleted a component and then created it again and try to give it the same name as the one you deleted, it won’t let you.